There are many genetic factors that make a champion race horse what they are. When looking at a pedigree we generally notice the well known names within said pedigree and say “wow, nice breeding”! Smart breeders look not only for conformation matches and proven breeding successes, but also character traits and racing will. In the case of 1989 Canadian Triple Crown winner With Approval, his genetic makeup encompassed the finest, and quirkiest quality factors from many of his ancestors. He had everything any owner, trainer, jockey or racing fan could hope for all wrapped up in one handsome package. With Approval was bred and raced by D.G. “Bud” Wilmot’s Kinghaven Farm. The grey son of Caro – Passing Mood by Buckpasser had the fortunate luck to have top notch connections, including Hall of Fame trainer Roger Attfield, and a world class pedigree. Let us first take a look at his pedigree. The second dam to With Approval was a mare named Cool Mood. She came from the first crop of foals sired by Northern Dancer. In fact Cool Mood was the first yearling sold at auction by this soon to be legendary stallion. She was bred by Kentuckian Harry Love from the Mahmoud mare Happy Mood. Love had Happy Mood deliver her foal at Windfields Farm in Oshawa, thus making her a Canadian bred, because the mare was returning to Northern Dancer for the next breeding season. Wilmot bought Happy Mood’s yearling filly at the 1967 Keeneland sale for $31,000. E.P. Taylor had urged his friend Bud Wilmot to buy the filly. Cool Mood won the Canadian Oaks and the Kirkland Stakes for Wilmot before joining the Kinghaven broodmare band. Wilmot was in the early stages of forming what eventually became a powerful force in racing and breeding. Cool Mood would prove to be a foundation mare to this enterprise. In 1978 Cool Mood produced a filly sired by the great Buckpasser. She was given the name Passing Mood. Passing Mood continued the stakes success for the family when she took the Shady Well Stakes in her juvenile year. Passing Mood produced five stakes winners, including her final offspring in Belmont Stakes winner Touch Gold. With Approval was Passing Mood’s fourth foal, and her only one sired by Caro. Caro was a very successful race horse and stallion. Bred in Ireland, he raced predominantly in France and won the Poule d’Essai des Poulins (French 2000 Guineas) and the Prix d’Ispahan and Prix Ganay. Caro began his stud career in France and had good early success, prompting Spendthrift Farm to organise a syndicate to purchase him and relocate to Kentucky. 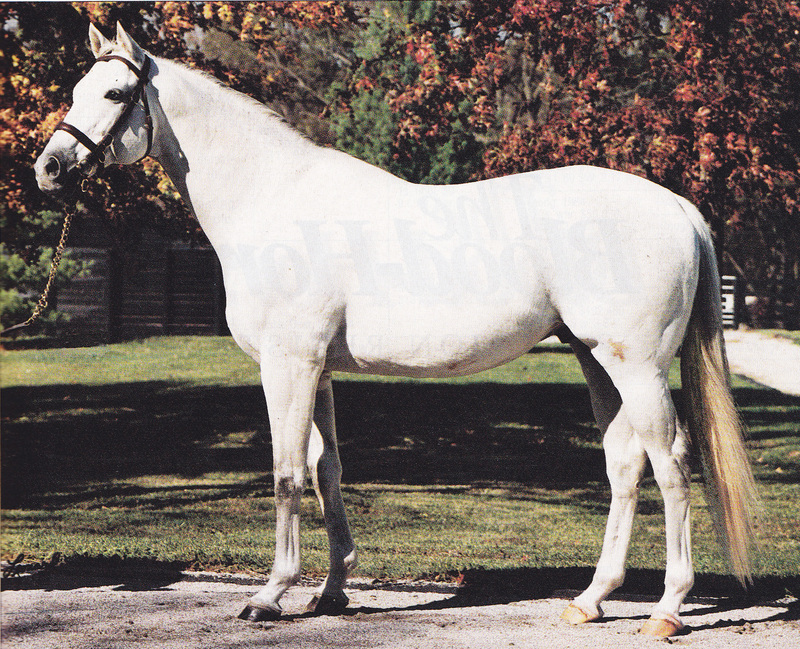 His grey colour came from his grand sire Grey Sovereign, a son of Nasrullah, and Caro established himself as a very important sire counting the likes of Winning Colors, Crystal Palace, Cozzene, Dr. Carter, Siberian Express and of course With Approval among his seventy-seven (12.5%) stakes winners. While With Approval obtained his colour and size from Caro, he got his personality and racing style from his dam’s sire Buckpasser. From all of his ancestors he got his talent. Buckpasser was an easy going, most of the time, horse that had a penchant for only doing just enough to win his races. Sometimes he would ease himself if he took the lead too soon in a race. This quirky trait cost him a win from time to time, so Buckpasser’s jockey needed to time the stretch drive so that Buckpasser made the lead close to the finish post. With Approval had this same characteristic in his mental makeup, hence his nick name with race fans, “The Cardiac Kid”. As he was learning his craft during his juvenile year, Roger Attfield could see the talent With Approval possessed. The grey colt however got loose in the stable area and hurt his shoulder, not seriously, but enough to delay his season debut. This meant that With Approval would not be ready for the big two year old races such as the Coronation Futurity. With Approval made his first start at Woodbine in an October 9 seven furlong maiden special weight race on grass. He won by two lengths. Attfield then got the colt ready for the one mile Display Stakes four weeks later at Greenwood, which did not have a grass circuit. In the race was the more seasoned Lordhyexecutioner, who had already won a stakes race and placed in two others. Here is the first time With Approval’s loafing tendencies would come to the surface. He took the lead at the top of the short Greenwood home straight, it was a six furlong oval, and then was passed on the outside by Lordhyexecutioner. With Approval along the rail then pinned his ears and put forth a powerful run to recapture the lead and win the Display Stakes. I was there to witness this and came away that day with a new favourite to cheer for. Little did I know that this performance would be one of many similar such performances. Roger Attfield sent With Approval to Kinghaven’s Florida farm to prepare for the following season. With Approval made four starts in Florida. He finished fifth in his racing return, won an allowance race, finished second in the Tampa Bay Derby and then ran unplaced in the Flamingo Stakes. All races were on dirt tracks. Time to go back home and prepare for the Canadian Triple Crown races. The Queenston Stakes marked With Approval’s return to Canada and also marked his first loss on native soil when after taking the lead at the 3/16th pole he began to coast and was passed at the wire by Domasca Dan. Don Seymour was his jockey and learned very quickly that With Approval had that well known Buckpasser tendency in his mental makeup. Seymour was in the irons for the Marine Stakes and the Plate Trial Stakes deploying a new tactic. He held off With Approval until the last eighth in both races and won both events by a close head margin. The Queen’s Plate, with her majesty the Queen Elizabeth the Queen Mother in attendance, came with glorious warm sunshine. Also coming with the race was a new incentive bonus sponsored by the Bank of Montréal. The incentive was, if any horse can win the Triple Crown a one million dollar bonus would be awarded to the owners of such horse. The Canadian Triple Crown had not been won since 1963 when Canebora accomplished the feat. A twenty-six year drought. With Approval was shuffled back early in the race and was more than ten lengths behind around the first turn. He began to move up along the backstretch to position himself to captured the great Canadian classic by a nose over Most Valiant, an irascible horse known around the barns as “Most Violent”. It was a thrilling fight to the finish down the home straight, one of the best such duels ever seen. The “Cardiac Kid” had arrived. The next race, the Prince of Wales Stakes at Fort Erie, With Approval this time fought Domasca Dan to win by a nose. Again the Cardiac Kid won another close one, and now was in line to win the Triple Crown and the bonus as well. Roger Attfield knew that With Approval was a far better horse on grass than he was on dirt. The grey colt had run his previous ten races on dirt and would now get to strut his stuff for all the brass on his preferred surface, and strut his stuff he did. There would be no close heart pounding finish in the Breeder’s Stakes for the third leg of the Triple Crown. With Approval won by seven and a half lengths ahead of Most Valiant, to take not only the Triple Crown but also the Bank of Montréal’s bonus as well. The performance was Secretariat like as he widened his lead through the stretch to Triple Crown glory. The euphoria of the Triple Crown win was tempered shortly afterwards however when With Approval suffered an injury and had to be taken out of training for the rest of the year. He had done more than enough to be named as the Sovereign Award Horse of the Year. While the press and fans had dubbed him The Cardiac Kid, With Approval’s barn had given the laid back grey the nick name Snoopy. “He was a very inquisitive horse” said Attfield. “The more the years went by, the more he got that way. Getting him from the barn to the paddock took a long time because when he saw something that interested him, he had to stop and look. If you tried to hurry him he would get annoyed”. Attfield added, “Every hundred yards or so he would do this, so we had to give him more than the usual time to go from barn to paddock”. The layoff lasted until March 7, 1990, when With Approval ran a lackluster fifth in a Gulfstream allowance tilt. Seven weeks later and much fitter, With Approval drew away from the field in another allowance race, this time at Keeneland. After a dismal showing in the Pimlico Special, a dirt race, Roger Attfield brought his star recruit home to Woodbine. Back on grass and in familiar surroundings, With Approval showed his fans that he was back. He won the Connaught Cup with one of his patented stretch runs. Attfield could see that Snoopy was coming into his best form. He entered With Approval in the grade two Bowling Green Handicap, an eleven furlong grass race, and shipped him to Belmont for the June 17 encounter. With Approval ran a fantastic race. He glided over the grass to win by a length and a half over Chenin Blanc and Alwuhush in a world record time of 2:10.20. The record still stands today. He followed that scintillating performance with another at Belmont when he again beat Alwuhush in the Tidal Handicap, setting a new stakes record. Moving on to Saratoga, With Approval finished a very close second to El Senor in the twelve furlong Sword Dancer Handicap. The lucrative Arlington Million was the target for Snoopy, so Roger Attfield put him into an overnight allowance race at Woodbine for a tune up. With Approval won the race and then shipped to Chicago. The field was formidable because the previous year’s Million winner Steinlen was back as well as the reigning Breeder’s Cup Turf winner Prized. The race boiled down to a stirring stretch run between With Approval and Golden Pheasant, with the latter prevailing by a short head at the wire. The race was run in 1:59.60, very fast indeed. Back to Belmont for another grade one tilt, the twelve furlong Turf Classic. At the finish With Approval was right there, but so was Cacoethes and Alwuhush both of which were a head and a head in front of the grey Canadian. Again the race was run in a fast time, 2:25 flat in this case. With Approval was holding his form and had earned a chance for the big prize three weeks after this race, the Breeder’s Cup Classic. The best in the world at twelve furlongs on grass showed up at Belmont for the two million dollar race. Cacoethes, El Senor, French Glory, fellow Canadian entrant Sky Classic, Prix de l’Arc de Triomphe winner Saumarez and Coronation Cup winner in The Wings were entered. Another challenge for With Approval was the turf course itself. Rain the previous day had made the course soft, which was not his preferable footing. “He likes a rock hard turf course” said Roger. “Before we would have scratched him from a soft course, but in this case we can’t. I just hope it isn’t too soft for him”. With Approval may have run his most courageous and complete race of his career in the BC Turf. He found himself on the lead at the top of the stretch but instead of waiting for a challenger he increased his pace and powered through the home stretch. He held the lead until the final fifty yards when In The Wings caught him and won by a half length. The conditions suited In The Wings more than With Approval and he took advantage. With Approval gave it his all in the race, and was that close to becoming a Breeder’s Cup champion. Due to a quirk in the rules back home for year end award consideration, With Approval was not eligible to win a Sovereign Award. A horse had to run a least three times in Canada for eligibility. With Approval ran twice, not three times. Regardless, he had proven his merit as a wonderful competitor and would now retire for stud to Live Oak Stud in Ocala Florida. His first year stud fee would be $25,000. He was transferred to Brookdale Stud in 1997 and then moved to Lanwades Stud in Newmarket, England in 2006. As a stallion, With Approval had consistent success, without getting a top flight horse. He did sire Canadian champion two year old colt Talkin Man in his first crop. Talkin Man won the Wood Memorial the following year and was in the mix for the Kentucky Derby but backed up in the race itself. Talkin Man went on to sire Breeder’s Cup Turf winner, and multiple grade one winner Better Talk Now, thus avenging With Approval’s heart breaking defeat in the race twelve years earlier. With Approval also sired Manhattan Handicap winner Mission Approved among the forty-seven total stakes winners he is credited with. He is also the dam sire of a pair of recent first class stakes winners in World Approval (Woodbine Mile, United Nations Handicap), and Miesque’s Approval (Breeder’s Cup Mile). With Approval was one of the more popular horses in Canadian racing history. He was talented and game, but he did have that tendency to not completely dominate when he had the chance. He won thirteen of his twenty-three starts, finishing second in five and third once. In his four grade one races he finished less than a length in cumulative distance from winning. With Approval won $2,863,540 in U.S. dollars for his entire career. This includes his $1,000,000 bonus for winning the Triple Crown. Beyond his racing statistics, With Approval is remembered fondly by those who got to know him. Snoopy was a pleasant and social horse, and enjoyed discovering new things to interest him. When he went to Lanwades to complete his stud career, his personality endeared him to his new English friends. With Approval died of natural causes at Lanwades in 2010, and is buried there in the farm’s equine cemetery. Personally I will always have a fondness for Snoopy, I mean With Approval. This appreciation stems from the first time I saw him at Greenwood when he came back along the rail to win the Display Stakes, his first stakes win. As he continued through his career, my interest in With Approval increased to the point that he is one of my all time favourites. I am not alone with my admiration. With Approval was handsome, friendly, and competitive and was admired by all who saw him. I loved this article as I owned one of his sons Lucius Vorenus. My Lukey was much like his dad in looks and personality. Such a wonderful horse. He died on Sept 11 of a guttural pouch infection. I am heartbroken. I miss my boy dreadfully. We didn’t even know he had an infection until he had a massive bleed. I feel like I have lost my child. Oh how I loved to watch With Approval run! He was such a beauty. Your articles are written with so much love for these wonderful horses. I read these stories and can see them again in my mind. Fantastic!! !